Gilliflower woodland retreat yurt is the most secluded and best suited for 1-3 people. From the door which overlooks our woods you can birdwatch and listen to the hooting of owls at night-time. It has a light and airy modern feel with bright primary colours; Turkish Killim rugs, Indian prints, an antique Mongolian tension band around the circumference with a handcrafted Breton bed. Tregonna King is suitable for 2-4 people (or 5 on request). 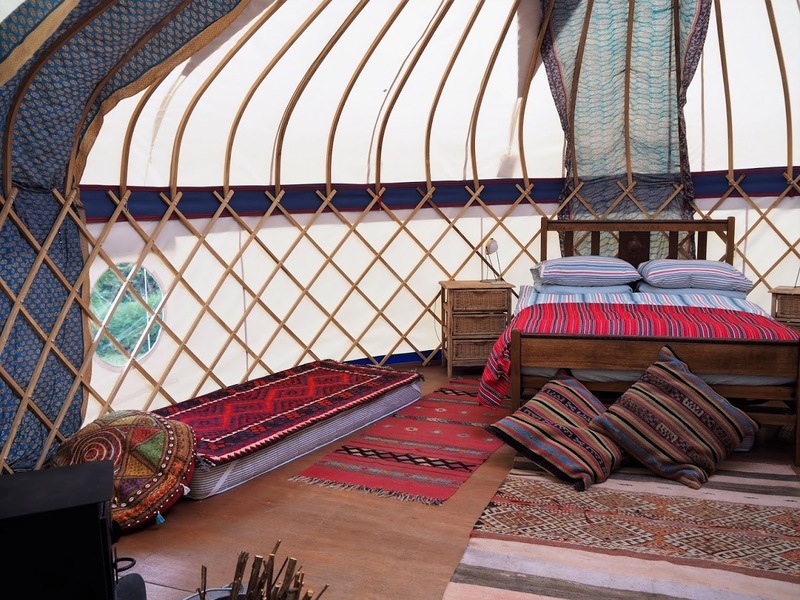 A Moroccan boutique style yurt with North African rugs, Indian silks and stripped back furniture. It is nestled in the far corner of a sheltered willow lined field, offering guests the space and time to reconnect with the earth. Like Gilliflower it is by our woodland, where you can listen to the hooting of owls at night-time and the chiff-chaffs and song thrushes in Spring. Fern Pippin is suitable for 2-4 people (or 5 on request). A Scandinavian feel to the wooden painted furniture, with soft pinks and greens in the Indian silks & throws. 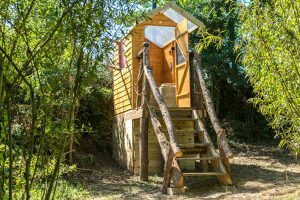 It is tucked in the top corner of the willow field, facing onto the stream and duck pond, conveniently placed for the shower & washing up facilities, so ideal for families. Our 3 holiday yurts are near some of the loveliest beaches Cornwall, and available from March through to October when the Cornish weather is best suited for glamping. Although 2-5 people can be accommodated, there is also ample space for eco camping outside. They are amazing constructions, expertly crafted by Joel Cudsen of Avalon Yurts in Somerset – from local ash, sail canvas and robust polycotton. 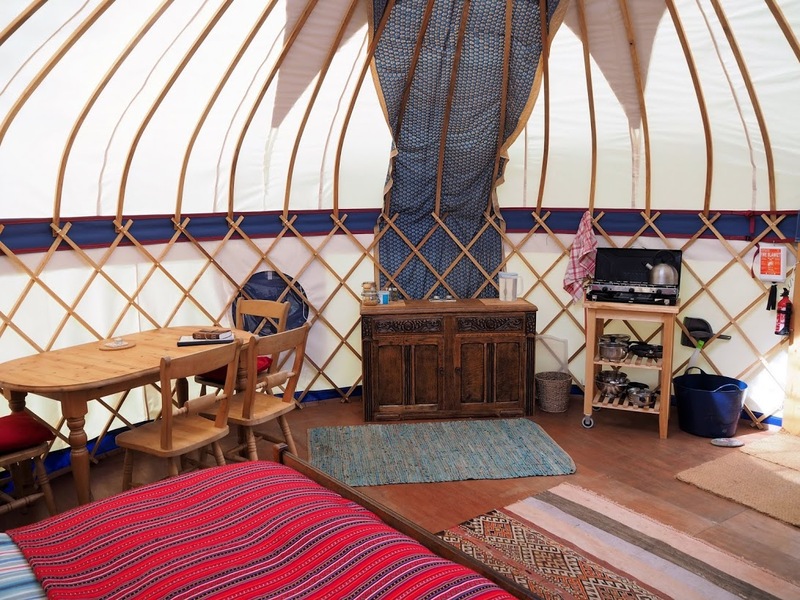 They copy the Mongolian yurt design but have bee well adapted our climate, managing to contain sleeping, cooking & living accommodation comfortably while maintaining a sense of space and light from the central crown. 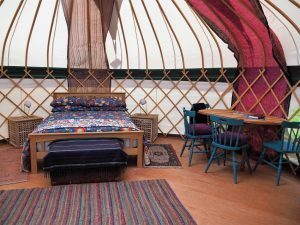 The effective wood-burning stove heats the yurts throughout the seasons and there is solar lighting. Warm bedding, all kitchen equipment are provided. 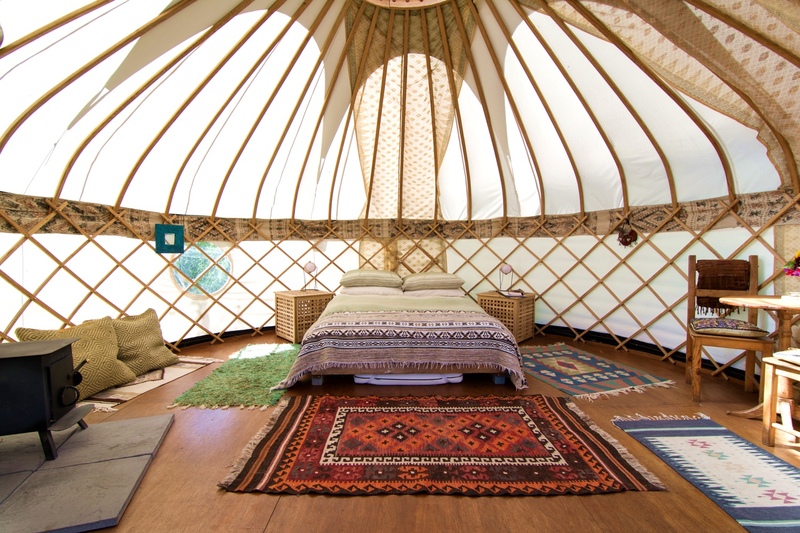 We provide everything you need for a yurt holiday in Cornwall. 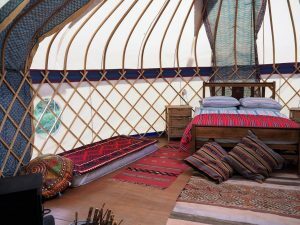 All yurts have solar lighting, warm (mostly!) showers nearby and their own and compost loo. There is a kitchen and eco-recycling shed with washing up facilities outside. 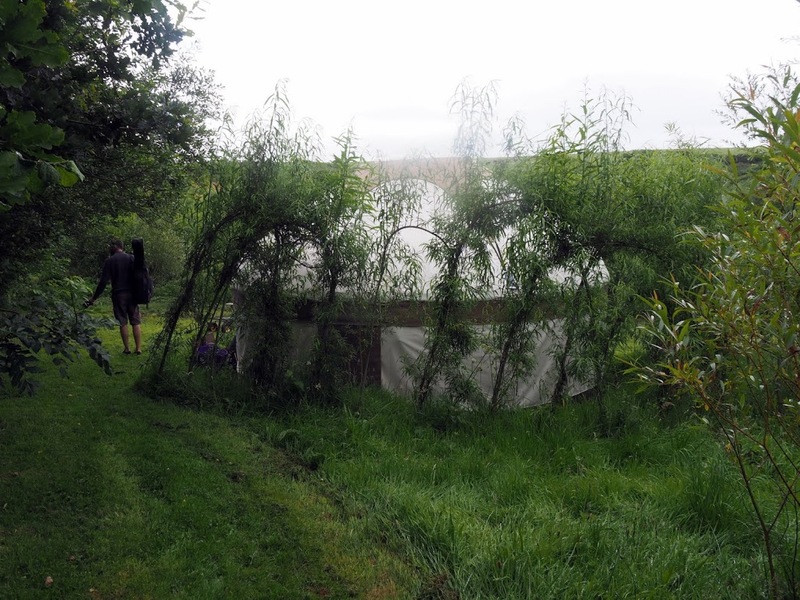 There is plenty of space in both fields for camping in additional tents, as well as picnic tables outside each yurt. Two small BBQ’s are in the shed if you would like to cook outside. We provide tea, sugar, seasoning, herbs, spices and eco washing up liquid. Our organic eggs, fruit and veg is available for sale and sourdough bread can be baked to order. We can make up a Cornish vegetarian food hamper for your arrival or breakfast the next day. Bedding – We provide duvets and pillows, sheets, pillowcases, duvet covers for the doubles, and bottom sheets for the singles. Please bring sleeping bags / duvets for the single beds and your own towels. Heating – woodburners, run on our own sourced wood; the first box is supplied free and further boxes are available for sale for £3 or £5, though you are also welcome to bring in your own wood supplies. Cooking & Eating – double gas hobs inside each yurt; kitchen hut for recycling and washing up, BBQ’s for each yurt with locally produced charcoal for sale; picnic tables outside each yurt. Food – tea, sugar, salt, pepper & basic spices. We can also supply seasonal organic veg, free-range eggs, delicious preserves (eg green tomato chutney, jams & marmalade), cordials and home baked sourdough bread. We offer various Taste of Cotna Hampers and have wholesale organic dried foods (oats, seeds, pasta, rice) for sale at reasonable prices. 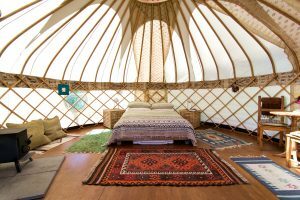 Yurts: What Should I Bring? Earplugs if you think you might be disturbed by birdlife or lambs calling! A wonderful escape from the hectic-ness of city life and the demands of the teaching profession. The kids enjoyed every minute of the freedom they encountered and learnt so much when they got involved in helping out around the farm. More people should aim to live with the values that Sara & Dave are promoting. We feel truly refreshed! Thank you! Cotna Eco-Retreat is utterly unique. My girlfriend and I enjoyed a blissful stay in the Gilliflower yurt, a cosy, comfortable and completely private accommodation. From start to finish we were in awe of this peaceful and self-sufficient way of living, being woken by the sound of roosters and nodding off to the crackle of the fire in the warming wood burning stove. Everything in-between (deckchairs in the sun, veggie meals al fresco, finding our way to the eco loo by torch light) added all the more to the organic enjoyable experience. Thank you so much to Sara and Dave who made us feel incredibly welcome. Breakfast was a delight thanks to freshly baked bread and condiments being delivered to the front door of the yurt. Also, upon arrival a chauffeur driven wheel barrow trip awaited us late on a Friday to transport our kit from the car to our part of the 14 acre farm. Perfect hosts who allow you complete privacy and freedom. The local village also does its bit by way of a very good local pub which happened to host a hay bale tossing competition during our stay…It doesn’t get much more rural than that! All in all Cotna is an amazing place which I hope to return to once again in the very near future. What an amazing week! Super yurt, wonderful hosts and amazing weather; from our photos you’d have thought we’d been in the Med! We particularly enjoyed being guinea pigs for the pizza oven, and fell in love with Vault beach. We’d love to come back again and we’ll definitely tell all our family & friends! This place is very extraordinary … Peace, friendliness, the most beautiful nature. Your are creating one of the most brilliant pearls on earth – THANKYOU. We’ve enjoyed our ‘family retreat’ very very much. Grateful love from The Danes! We had such an amazing week on your beautiful farm. 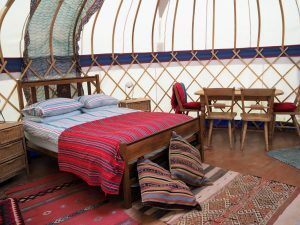 The yurt was so comfy, everything we needed was there. I feel really inspired by the life you are living down here… Thank you for making us feel so welcome. Tonka (dog) has had such a nice time here too, thanks for letting him stay too! We will definitely be back, I can’t wait! 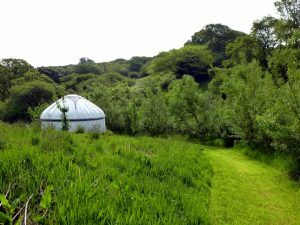 My first time in Cornwall and my first time staying in a yurt! What a lovely Easter break we’ve had. The yurt is fun and cosy and well-equipped. The surroundings are beautiful and the hospitality at Cotna is warm and relaxed. Thank you for the fantastic break and the walking tips. We hope to be back again. A beautifully tranquil week away from all the hustle and bustle. 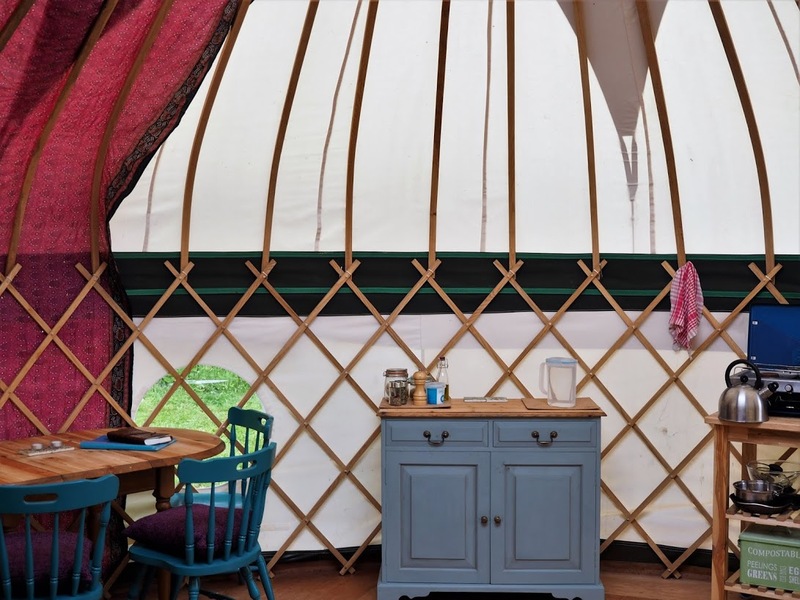 We have really enjoyed discovering Cornwall (especially Mevagissey) and have found the yurt to be a perfect place to allow a tattered and battered soul to recharge and replenish positive energy. We have had such a wonderful time. This has been one of the best holidays we have had. There is a great sense of community and harmony on the farm which is fantastic. Our daughter has loved the freedom Cotna has to offer and the morning strolls to visit the horses & chickens. You have been great hosts and what you have created at Cotna is inspirational. We will definitely be returning and would highly recommend it to other people considering a yurt holiday in Cornwall. Thank you for a magical stay. It was more than we could have hoped for. 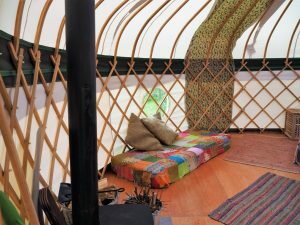 Very inspirational place and the yurt was a romantic and peaceful setting. We will definitely recommend Cotna. Thank you for a lovely break in your yurt. It’s been wonderful to stop and rest surrounded by beautiful nature and bird song. We really enjoyed doings lots of walking, playing scrabble by candlelight and not knowing what time it is! For a good days walk we recommend Cotna-Porthluney Cove—Dodman Point—Gorran Haven—ending a with a pint / icecream in Mevagissey. Thank you! We enjoyed a peaceful and restful honeymoon here. We knew we wouldn’t want to leave and we don’t. So we’re taking some peace and rest back to Brighton with us.